The Procession of “Las Turbas”, as the “Camino al Calvario” (The Road to Calvary) is popularly known, takes place on Good Friday. It is the most emblematic procession of the Holy Week of Cuenca as it is the only one on which the “turbas”(mob) take part in a procession. The “turbos”, as the members are known, recreate with bugles and drums the mockery Jesus was subjected to on the way to the crucifixion. The Holy Week of Cuenca has been declared of International Tourist Interest. The “turbas” are comprised of members of the different brotherhoods of Cuenca. Nowadays 2500 “turbos”, dressed in their brotherhoods’ tunics and carrying drumms and bugles take part in the procession. The first procession held early morning on Good Friday, dates back to 1616. Therefore this year marked its fourth centenary. The “Turbas” did not appear until 1860, accompanying the Jesus of Six, one of the “pasos” (floats with wooden religious sculptures) of the Brotherhood of Nuestro Padre Jesús Nazareno de El Salvador. At that time, only 13 people were taking part as “turbos”. Some decades later, after the Spanish Civil War, it was necessary to pay the “turbos” to rekindle the procession. Twenty four were paid at that time, and they are still being paid to date. It is believed that originally, the “turbas” were linked to the old traditional pagan festivals which were taking place with the arrival of Spring. Seeking a religious meaning to the festival, they were turned into processions and drum parades. 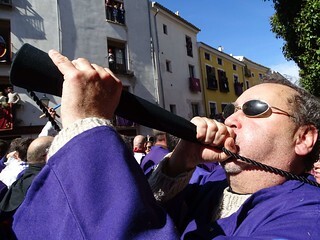 With respect to the bugles and drums played by the “turbos”, they are part of our traditional religious culture, being a key feature of some Spanish Holy Weeks, such as at Calanda or Hellín. It takes around seven hours for the five “pasos” to parade the streets of Cuenca. They belong to three different brotherhoods. Hundreds of “turbos” are around the church of El Salvador from early morning. At 5:30 am the gates of the church open. The bugles take their turn as the image of Jesus leaves the church; just after the beating of the drums, the screams and the “palilladas” start. The mobs walk in front of Jesus, facing him. The last “paso” in the procession is the virgin of the Soledad, and as a sign of respect for her, drums and bugles are not played around her. Shortly after, the procession passes in front of the forge, which has been lit for the occasion. Just the sound of the hammers blows on the anvil can be heard until the virgin appears, then the choir sings to her. It is already daytime when the “pasos” make their entrance into the Plaza Mayor. The procession will pass under the triple arcade of the town hall. It is here where the image of San Juan Evangelista is the most “danced” (the float is swung on the spot), following the request from the crowd. On the way back to El Salvador, there is another moving moment. A deathly silence descends for the traditional Miserere, which is sung from the steps of the church of San Felipe Neri. There is a “Good turbo Manual”, which reads: “without pushing nor hindering and respecting the procession”. Much to the regret of the dwellers of Cuenca, this procession is also known as “Procesión de Los Borrachos” (The Drinkers’ Procession). This is due to, on the one hand, that as it was not easy to blame Jesus, the “turbos”-after the Civil War- used to drink liquor before the procession (resolí is the one made in Cuenca) in order to become uninhibited. And on the other hand, in the seventies and eighties this procession became an attraction for young people, who were visiting the city that night looking for binging, disturbing during the procession and causing confrontations with the police. “Las Turbas” is unique in Spain. If you want to see this procession, I strongly advise you getting early to the square of El Salvador, at least three hours before the start of the procession. Otherwise you won´t be able to see the excitement of the exit. And take your time to visit the beautiful city of Cuenca, a Unesco World Heritage city.